Trying out some ideas for shooting hands-free video using my Panasonic Lumix DMC-ZS19 camera for the upcoming bike tour. Being totally self-supported and traveling alone, it takes a bit of creativity. This camera does very good video for its size and weight. The back of the Giro helmet has a Cateye red LED flasher mounted with zip ties (a safety item to use on the open road). 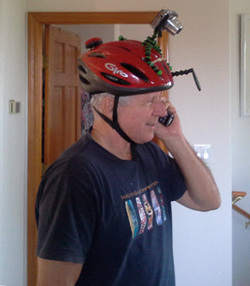 Top of helmet has a Joby GorillaPod attached to the helmet with zip ties on which the camera mounts. This mount would be used mostly for off-bike video verite scenes. On the left hand side of the helmet, there is a mirror mounted with zip ties made by Efficient Velo Tools LLC. This is unique mirror allows the rider to see what is coming from behind. It does not budge once adjusted and the size of the mirror is a bit larger than most others on the market.